Anyone who has engaged in SEO over the years can attest to the various tactics that marketers and SEO pros have used to gain that extra boost in search engine rankings. Somewhere legitimate approaches and some were just down right unscrupulous. 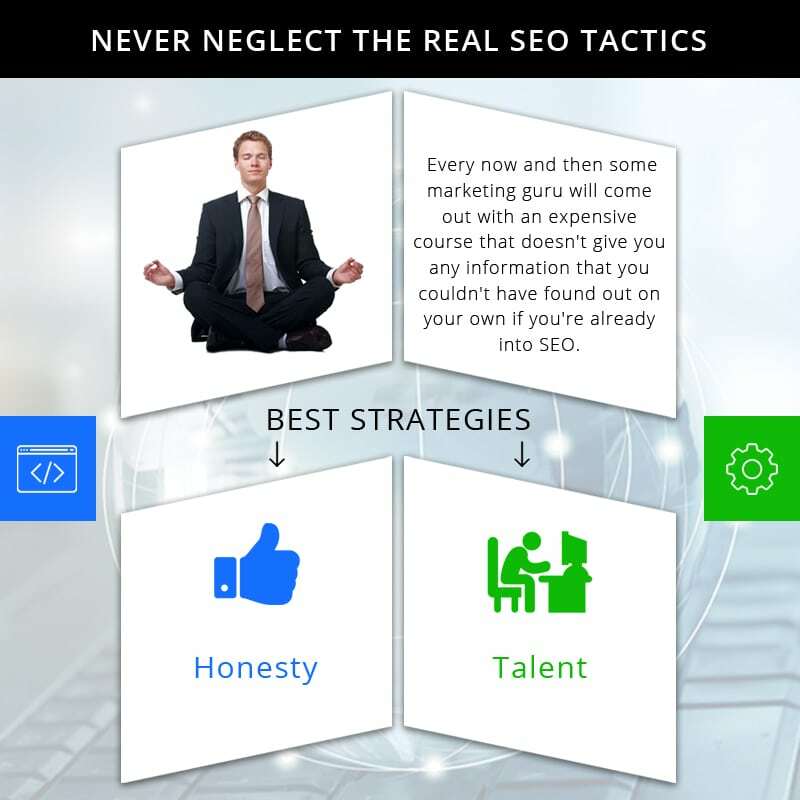 There’s no big secret to tactics that are clean and reputable for solid SEO and here we’ll look at the real SEO tactics that work. Everybody and their brother has tried every kind of tactic possible to gain on the competition in SEO. Every now and then some marketing guru will come out with an expensive course or seminar series that basically doesn’t give you any information that you couldn’t have found out on your own if you’re already into SEO. For the newby, however, these courses and seminars and tactics look like the gold at the end of the rainbow, however, when you look at them, they’re just basically common sense with some technical jargon and marketing bells and whistles. In the past, emphasis was more on keywords, keyphrases, and keygroups. The competition for the top keywords then became a three ring circus with people stealing from one another like crazy. Then came the buying of keyword positions and the like. It just turned into a mess with great products and services not getting the attention they deserved. Google noticed this in the results and saw that the public was being spammed to death and rerouted to criminal and low quality producers. This brought in complaints and worse. Now Google has come out with guns blazing with software algorithms that even Data on “Star Trek: The Next Generation” couldn’t figure out. These algorithms know all the games that can be played and has put marketers and SEO pros on a constant state of alert. So where does this leave SEO? What can be done? What tactics work? Well, thanks to Google, the best strategies are what they should always be: honesty and talent. Content is still king and it is expanding at an alarming rate. Problem is producing quality content hits a stone wall for two reasons: rarity and cheapness. Marketers know they need great content but aren’t willing to pay for it. They hire cheap writing mills or cheap graphics and video production and fortunately, it shows. People will not ‘like’ or ‘share’ or ‘comment’ on crappy content but explaining this to marketers and SEO pros is like talking to a brick wall. The trick nowadays is that Google is meriting and validating organic social network interaction. Seeing that people are interested in your site and its contents and are willing to share and discuss it with inbound links from various Facebook pages and accounts, no one can duplicate with software and scripts. Today, trying to outsmart Google is useless and will result in penalization of a harsh and unforgiving manner. This all means you need to be original. If you’ve a site focusing on new plumbing technologies, then your content can’t be the same run of the mill stuff you see on the company’s promo pages or Amazon reviews. You need to write or have written, honest, true, and in-depth reviews and commentary that attracts the public, engages them, and serves them value in some way or another. So be original, know your audience, provide pro-level on all levels and you’ll get the results you’re looking for.